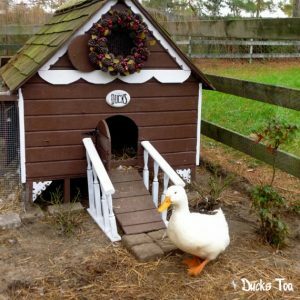 Make a duck house should focus to the comfy thing that make duck feels the really home. As same as usual home, it would have to be comfortable, safe, and the main thing is can protect them by sunlight and rain. It would be plus point if you can make it simple and easy to duplicate. Also, if you can make it by cheap ingredient, well we think you have double jackpot of it. Another thing that you should consider when you start to make duck house is the materials. It has to be not used by threat materials like sharp. Wire isn’t recommended material to use when you build the duck house. The sharp surface will hurt the duck if you not careful when you make it. Beside the materials, there are some terms that you need to fulfill to build the duck home. All terms are written below. The top of the duck house must be able to protect the duck from sunlight and rain. The roof tile is the most recommended top because it is durable. The duck house better on the east. As we know that the sun is rise in the east so the morning light can be inside and reduce the smell. Besides, the duck house can be still dry so it avoid by any disease attack. The duck house which too narrow isn’t good for cattle duck because it limits the growth. And the width duck house isn’t good for egg duck because the energy will waste because they have to running to explore the house. This lost energy can decrease the production of eggs. So the key when you build duck house is make it suit both of the size of duck house and the type of duck. The height of the wall’s duck house should be 60 centimeters from the floor. Here are the steps that you need when you want to make a comfy duck house. One of the all steps that you do it first is prepare the materials. Actually there are many materials that we can used for make duck house. But as mentioned before you must choose one best of the best material which is safe for the duck. So the most recommended material to make it is bamboo. We can get the bamboo from plant that we can easily meet all around us. Even when you can’t find it and forced to buy it, the price is not expensive which is still reached by all. Beside the main materials, some materials like lamp that used to be heater, lock door that used as safety, pipe as watering system, and other equipment should be prepared well on this point. After that, measure the size of duck house with the ground. The measuring process should consider by three things, grounds, the duck old, and the type of duck. The small ground you have should limit the size of duck house you make. So if you have limited ground, there are two options that can you choose, cut the number of the duck or make it piled up. Well the choice is in your hand if we talk about it. On this point, we are not only talked about which one side that the duck house should be face but we are also started to talk about design. As mentioned before that the right side to make a duck house is east. After that you need to pick the position where is the door, how much is the bulkhead that you needed, how the watering system walked, how about electricity installation, and how the air circulation flow. This step is execution step. On this step, you are started to installing and applying all factors that already counted before. You can use nail to connect the bamboo to build a construction. The top of the duck house should be able to protect them by sunlight and rain. Basically there are some materials which lightproof and waterproof like thatch but it not lasting. So we need something lasting like roof tile. Even it is easily broken, this tile is able to reduce the temperature inside the duck house. Also, the tile is so lasting so it can use for long time. After the top now we move to the wall. Same as top, there are many materials that we can do to use as wall. You can use something such like woven bamboo, wire casa, or plywood. The wall of the duck house can use for bulkhead which separate a group of duck with another else. After that, let’s talk about the base. Mostly, farmer just let the duck poop falls directly on the ground. Well there is no wrong with that. But the best base for duck house is place something like sawdust, husk, and lime. These materials proved able to reduce the wet in the floor duck house so the it keep clean and avoid some disease to attack that caused by moist. Make sure that you already smooth the bamboo. The side sharp bamboo can also hurts the duck. Smooth the area that you think you need to make it smoother. Even the duck are also need moist, watch over their humidity. Over moist can make some disease comes and something like fungal growth. So control it as well. The point that you must fulfill when you build duck house is how the duck house can be make you easy to treat and take profit by duck, so don’t make the duck house which make you hard to manage it. Add some ornament is good but make sure that that is useful. If the ornament is useless, you better leave it. Be careful with paint. Choose the paint which doesn’t have strong smell. Strong smell that comes out by the paint can threat the duck or moreover stimulate any respiration system problem. So be careful with it. That’s all the easy steps to make a comfy duck. So anybody wants to try this at home? Sure you can do it!